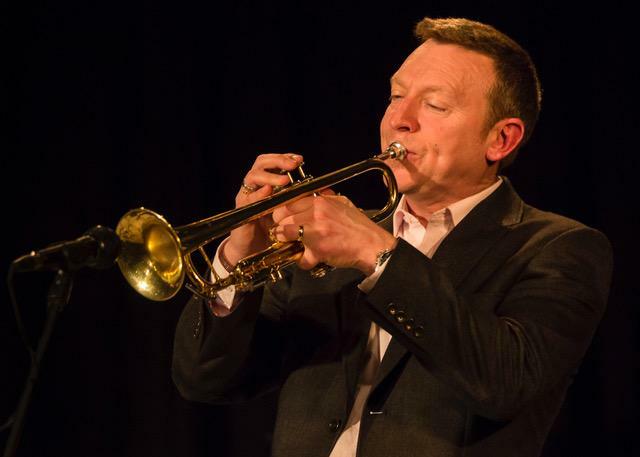 Led by local trumpet and flugelhorn star Stuart Henderson, a stellar group of local and visiting musicians promise you an evening of the greatest classic and contemporary jazz. Bringing you the music of the most iconic jazz stars from bebop and beyond. An evening at the Fringe Festival not to be missed. The band leader Stuart Henderson was, from 1983 to 2005, a leading trumpet player in Her Majesty’s Household Division and during that time performed at venues worldwide and at every state occasion in London. He performed as a soloist and band leader many times for the Royal Family and World Heads of State. Since leaving the services in 2005 he has become a fixture on the jazz scene appearing with icons such as Peter King, Don Weller, Art Themen, David Newton and Michael Feinstein. He leads his own quintet and trio, directs the remix jazz orchestra. Our guest visitor from Dusseldorf Jazz Ensemble is saxophonist Reiner Witzel. A graduate of the Manhattan School of Music in New York, he has taught at the conservatories of Dusseldorf and Frankfurt, and is a guest lecturer at various German universities. He is co-founder and member of the Jazz Ensemble Düsseldorf. He has performed widely throughout Europe and other continents and his festival appearances include Montreux, Montevideo, New York, San Jose, Odessa, Xi’An, Yaounde, Zanzibar. Stuart and Reiner are supported by a formidable rhythm section will guarantee that once the fuse is lit sparks will fly throughout the evening. Pianist Pete Billington is much-in-demand for his versatility, inventive soloing and skills as a sensitive accompanist. Raph Mizraki is simply phenomenal. He has drawn on his multi-instrumental background and all-embracing interest in classical, folk and cross-cultural music to become one of the best jazz bassists in the UK. Simon Price on drums rounds off this high-voltage trio. Any situation, any tempo, any rhythm – Simon keeps things swinging. As the great Art Themen remarked, ‘There are not many drummers who can do that!’ I can confirm Art’s remark and I’m sure he wouldn’t mind us using it. This an evening that should not be missed! !